Close-up image of surgeon putting on stitches during cosmetic plastic surgery in hospital operating room. Private, confidential and discreet After Care Services are provided personally by Yamil Sarabia, MS, LMT, EMT, LE. Choosing the right surgeon is the most important step before any surgery, but planning and choosing the right person to help you through the first 24 to 72 hours or longer, is key to a successful and quick recovery. As kind and loving as a family member or friend may be in wanting to help you, they may not be prepared to witness your condition and may not be prepared, as a professional caregiver may be, to handle the acute care you need for the first few days following your procedure. 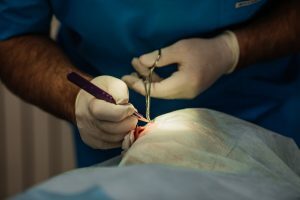 Although complications from common surgery procedures are not usually routine events, they can be serious when they do occur. Hematomas or pooling of blood from a broken blood vessel may need to be drained quickly by a doctor and this and other types of problems can be quickly spotted faster by NYS certified EMT with hospital experience than the most caring layperson. Wether you choose to recuperate in a hotel room or in the comfort of your home, you need a place where you can focus on yourself and be worry free from your personal obligations in a peaceful environment with someone that can tend to your doctor’s discharge instructions like putting ice on you during the first 24 hours and making sure of your nutritive intake as well as your personal needs. Yamil is a New York State certified EMT and NYS licensed Massage Therapist and Esthetician with over 15 years in both the medical and beauty industry while staying focused on the Holistic Perspective. As a licensed holistic health practitioner, Yamil can provide healing energy treatments, CranioSacral Therapy, Lymphatic Drainage techniques, and Reflexology for a faster recovery. Every operation, no matter how minor, is accompanied by swelling and Lymphatic Drainage Therapy is an efficacious treatment to reduce the swelling following surgical procedures. Yamil has extensive experience caring for patients of various types including emergency care patients and stable medically ill patients while working in hospital and Home Hospice patients. A compassionate, intuitive nature combined with skilled and educated hands, Yamil is ready to be your God Send. 50% Advance deposit required. 30 Days from date of surgery cancellation policy-full deposit refund. Up to 14 days prior to surgery date-50% deposit refund. Less than 14 days prior to date of surgery $0 refund. Total balance due by date of surgery. Because your well being is our paramount priority, please know that Yamil Sarabia, Holistic Health Practitioner is not a MEDICAL DOCTOR. Recommendations are not a substitute or to be construed to be medical advise of any kind. It is your responsibility and it is advised to contact your medical doctor regarding any medical advise and/or medical recommendations. You must sign an agreement that you understand the above and that you are cleared by your physician as not needing additional care other than the protocol of a NYS certified EMT.